Discover 100+ recipes for homemade ice cream, frozen yogurt, popsicles, and more in my frozen dessert section! Bookmark this page and check back often for new recipes. It's easy to make your favorite homemade ice cream with just two ingredients - you don't even need an ice cream machine! 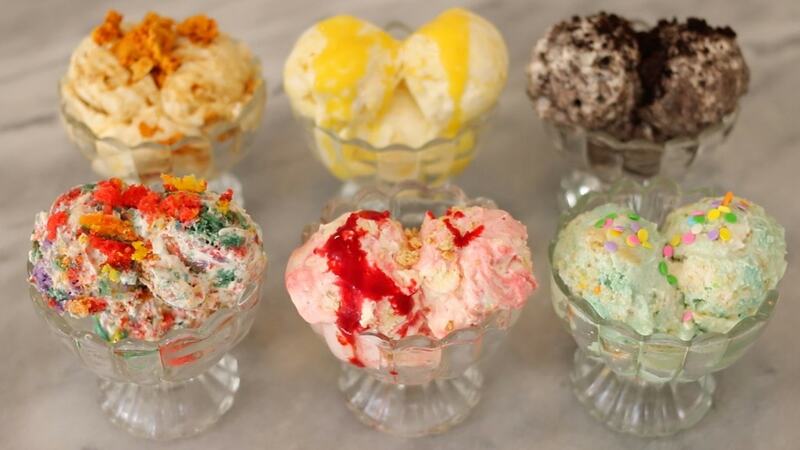 My ice cream recipe is the perfect base for all of your favorite flavors. Go classic with vanilla ice cream, chocolate ice cream, or try one of my bold combinations below! Don't see your favorite flavor? Try the search bar! If you can't find what you're looking for, let me know on my Homemade Ice Cream Base Post. No ice cream party is complete without ice cream cones! Go gourmet in no time flat. SUBSCRIBE TO MY FREE EMAIL NEWSLETTER! Save the ice cream scoop and make your own soft serve ice cream. Make fro-yo at home with my homemade frozen yogurt recipe. Don't do dairy? No problem! There's room for everyone with my 2 ingredient dairy-free ice cream recipe. Don't let dairy hold you back! Enjoy your favorite flavors with my dairy-free ice cream. With just a few calories and fresh flavors, my popsicle recipes are the perfect healthy snack for summer fun. Keep it sweet this summer with my other frozen desserts! I’ve got you covered with my ice cream cakes, rolled ice cream, fried ice cream and more.